The days of the plastic credit card, stamped one way or another with digital data about you, are done. You may remember when credit card machines weren’t so reliable, so stores sometimes used that little aluminum contraption with a roller over your card, and you had to sign the printed copy hard enough to ink onto the carbon paper. This is one of the reasons some cards still have those raised silver numbers on the front alongside your name and expiration date. Even in spite of innovations like the magnetic strip, embedded data chips and early NFC offerings, the tech behind credit payments in stores hasn’t actually moved far beyond those raised plastic numbers. Until now. It looks like your old plastic might spend more time in your desk drawer than than your bag or back pocket. Today Apple rolls out an app that lets iOS users shop for products through Apple. The app is actually hooked up to physical retail stores. That means you can order something through your Apple device, then make your way later to a store to pick it up for speedier access to your new goods, with no delivery fees. But the app’s much more than a digital assistant. If you happen to be near an Apple store wanting to buy something, but don’t want to wait in line, you can order it and get a coffee. Then 12 minutes later, when back-of-house staff have fished it off a shelf, you can pick it up in-store from a special desk, sign for the item, and leave. Because the payment is processed through your Apple ID account’s registered payment (your credit card number), this should even work if you’ve left your card at home. And here’s the best bit: If you’re in-store and want to buy something off a shelf, you can pick it up then snap a picture of its bar code. The app does all the object recognition (with, we assume, location-awareness so it knows which store inventory you’ve depleted) and you simply click to buy it via your Apple ID. Having done so, you’re apparently free to walk out of the store, purchase in hand. That’s a huge amount of trust, but it’s only for the cheaper items you can get off store shelves, and you can argue a bold innovation needs brave decisions like this. There are a couple of big limitations: It only works in Apple Stores, and you need an Apple ID. But what Apple’s done is innovate and speed the entire purchase by replicating credit card processing, cash registers, and an in-store payment/inventory system in an app. It works because Apple’s in control of both ends of the transaction: It happens through its devices, using its app and associated security, in its physical stores, selling its products and accessing its database (one of the biggest there is in the world) on your credit card details. The vital detail is that the numbers relating to your credit card (that identify it, flag it as in-date, identify you as the owner) are all virtual. There’s no need for NFC, no need to swipe your magnetic strip or type in a PIN. Even when paying for higher value items you merely have to prove you’re the person who owns the relevant Apple ID associated with the transaction … which is a signature, for now. It has so many benefits that it’s tempting to see Apple using its stores as a test-bed before rolling out something similar as an entire payments infrastructure (“iPay”?) to other retailers. Square is in the news beacause it’s taking payments via Square hands-free and, in fact, free of any sort of need to swipe, sign, or wave anything at the cash register to pay. Instead at participating retailers (who’ve synced up to your iOS Square Card Case app, and thus know who you are and that you have a digital means of payment encoded in the app) you simply have to say your name. The salesperson will look you up on their iPad interface, check your face matches your name–to prevent a thief using your ID–and then tap to effect the payment. It’s enabled by iOS 5’s geofencing, meaning the device can securely identify itself as being in a position within about 330 feet of an approved Square retailer. When you stroll near the shop, the system identifies that you may be about to drop by and thus opens a tab ready for you (again, this stops a casual thief from using your tab when you’re somewhere else). The tab is closed if you move out of range. Square’s replacing the physical credit card (those 16 raised numbers again! ), and traditional card interactions with cash registers, with a virtual transaction that uses your iPhone as part of a secure key to identify you. To U.S. consumers–still used to credit card systems that have been surpassed with swifter, more secure versions in Europe and elsewhere–Square is often held up as an example of the future of payment tech. But there are limitations: The number of retailers who’ve signed up is limited, the system could get confusing for retailers with a customer base of thousands of people, plus your photo isn’t necessarily the most secure (or hack-proof) way to ID yourself. And if your name is Zbigniew or a name unfamiliar to the average American, then you may find the system stumbles at the salesperson interaction, particularly at a bigger retailer that’s not as familiar with you as, say, your corner coffee shop (just talk to Google+ about its hugely embarrassing mis-treatment of foreign-sounding names). Square certainly can innovate around these issues, though. And perhaps one way to boost security is to borrow an idea like Apple’s “sign your signature with the corner of your iPhone” identity proof. What Apple’s system and Square’s system have in common is that they are new ways to convey just a tiny sliver of data from your credit card company to a store’s computers: They’re just slicker, swifter, and perhaps less expensive ways to do so than printing the numbers off your plastic card itself, in person. Even the hot-topic NFC “wave and pay” system is just an iteration of current credit card tech–in its simplest version your actual card has a wireless loop in it that transfers those same relevant numbers, and in its cleverest version the numbers are encoded securely in an app on a smartphone. Other firms have quickly latched on to the idea that it’s this communications channel for data that will change how we shop. Scvngr is using QR codes to effect a clever mobile payments solution. PayPal has been trialing a system that is a little more similar to Square’s (because it too has a database of approved credit card numbers and a way to securely ID the owner of the data), and had taken a firm anti-NFC position…until this week, when it’s softened this stance and may embrace NFC wireless solutions in the future. And conscious that its business as the supplier of credit card reading hardware to stores may evaporate if systems like Apple’s and Squares became common, VeriFone, which makes a huge number of the machines used in the U.S., has just bought “a leading provider of next-generation mobile retail solutions, Global Bay,” which will help it extend “new smartphone- and tablet-based shopping and payment experiences to retail organizations.” Sound familiar? Amazing though these innovations are, the real strength behind them seems to be overlooked in the press. Square’s system hints at it overtly, as does Google’s brand-new Wallet wireless solution–the abilty to integrate store loyalty systems into the exact same action as the payment is potentially powerful. Apple’s system reveals another secret, if you think about it: A more streamlined product delivery service to stores should be possible if more people shop beforehand by apps. But these are only the simplest benefits. What’s to stop Apple from giving you a tiny discount on your purchase if you agree to download advertising to your phone at the point you walk out of the store with your new item? Why couldn’t a coffee shop offer you extra loyalty points if you accept an ad for cakes at a nearby partner patisserie when you pay wirelessly, and that store itself offer you a money-off reward for following its invite? That’s why Apple’s system, Square’s system, and competing services from Google, PayPal, and even the credit card companies themselves aren’t individually a model for how a post plastic-card payment system will work in the next five years. What we’ll end up with will be a clever hybrid, possibly saddled with a slighly heavier proof-of-ID burden at the behest of credit card firms, but which may be even more frictionless than Apple’s “use the app, then just walk out of the store” model. 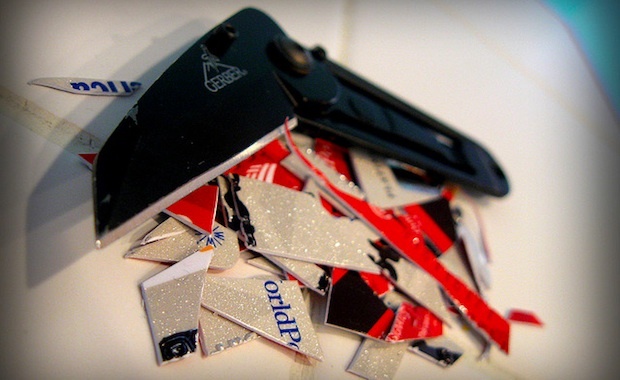 In the end though, the plastic credit card’s days look numbered.